"A controversy took place in the church conference, and two congregations in Greensburg resulted--one under The Evangelical Association and one under The United Evangelical Church. The United Evangelical Group erected a church which was dedicated as Trinity United Evangelical Church in 1895. 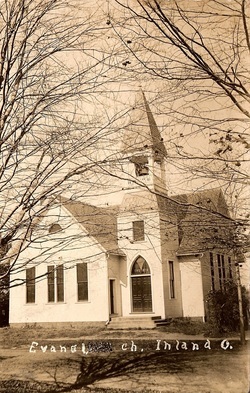 On December 22, 1889 a new frame church was dedicated and named Emanuel by The Evangelical Association. These two churches were across the street from one another. On October 14, 1922 at a special conference the two churches, The Evangelical Association and The United Evangelical Church were united under the name of The Evangelical Church. Therefore, the two congregations combined their forces for a united church. Plans were agreed upon to sell the Trinity property and apply the proceeds for extensive improvements to Enanuel Church, and the building was rededicated on October 25, 1925. In 1940 a Sunday School annex was dedicated." "The United Evangelical Group erected a church in 1895, under the pastorate of J. H. Elder, at a cost of $3,000. It was dedicated November 17, 1895, as Trinity Evangelical Church, by Presiding Elder G. W. Brown. The class was very active with live organizations for a number of years.